Earthborn Silicate Masonry Paint can be use on all mineral-based surfaces e.g. stone, masonry, concrete, pebble dash and plaster surfaces. It can be used both inside and outside the home. For a crisp, classic finish to external masonry, Earthborn Silicate Masonry Paint offers a high performance alternative to limewash. Being water based and VOC free, it allows walls to breathe. Yet its special formulation with sodium silicate makes it very hardwearing. It is water repellent and can withstand severe extremes of weather. Earthborn Silicate Masonry Paint does not yellow or fade with time and can be washed down to keep it looking fresh. High performance alternative to limewash. Water repellent, weather resistant, does not yellow. 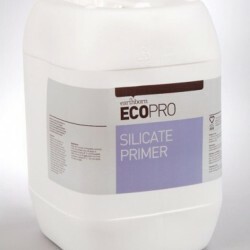 Easy to apply with standard brush, roller or suitable spray gun. Low acrylic content, highly breathable. Earthborn coloured Silicate Masonry Paint is great for interior or exterior use, restoration work and historic buildings, new or old masonry, all mineral surfaces including brick, stone, concrete, pebble dash, plaster and render.